Dropping our bottle of messages into the Gulf Stream on January 4, 2017 as we crossed from Florida to the Bahamas was a milestone in our lives. We had saved the wine bottle back in Telluride when we first started planning our sailing trip with a plan to eventually drop it in the ocean, full of messages. The bottle was from our favorite bottle of wine that we had purchased on our honeymoon. Trav asked Viv to write a note and draw a picture to put inside of it, and for months the bottle sat on our kitchen counter, a symbol of our sailing goal and a reminder to keep working hard so we could make it a reality. Over time, we all added our individual messages to the bottle: notes about ourselves, our family's travel plans, stories about our Chocolate lab named Sadie who would be accompanying us on our trip, and our contact information. Months later, in the early morning hours of January 4, 2017, as we crossed the Gulf Stream between West Palm Beach,Florida and West End, Bahamas, Vivian dropped our bottle full of messages into the ocean, and we watched it float away. The crossing of the Gulf Stream is a milestone for most sailors, and it was a a momentous occasion for the Moxie crew. Greetings from Bermuda! Attached find a photo of my mom who found your messages in a bottle off a small island in Bermuda . We are a portuguese/bermudian family from Azores/Bermuda. 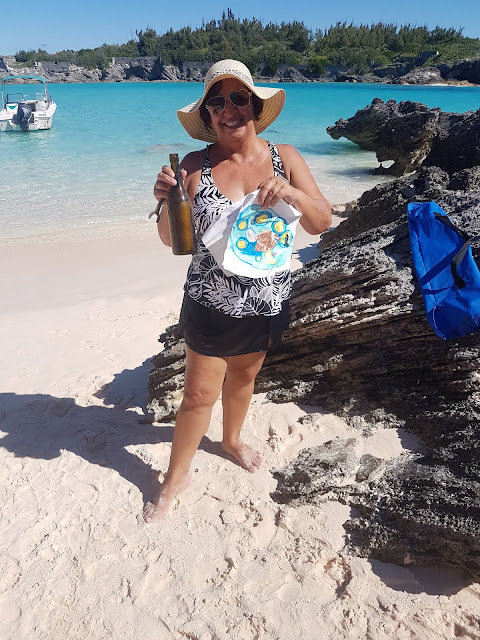 Here is the Bermudian lady who found our bottle. She is holding one of Viv's drawings and a tool that we are guessing she used to get the cork out. We were astounded. Our bottle had been found. Trav immediately looked at a map and discovered that in the last 19 months, OUR BOTTLE HAD TRAVELED OVER 1,000 MILES. It was found intact, our messages were readable. And consider this: Bermuda is a tiny island, only 15 miles long and 2.5 miles wide in the middle of the Atlantic. The fact that our bottle found its way there is nothing short of miraculous. But the wildest, most serendipitous part of all of this, is that the family who found our bottle has a Chocolate Lab named Sadie. (In case you are new to our story, we had a Chocolate Lab named Sadie who passed away at age 12 last March.) This incredible coincidence still has us reeling. We know it's a sign from our Sadie. She's letting us know she's still with us. Trav's amazing Mom (Ginger) hooked us up this year by sending in a postcard to The Lost Kitchen's lottery system on our behalf. We are seriously in her debt. Prior to the arrival of the many courses of the delectable fixed menu, a smorgasbord of inventive and tantalizing appetizers are presented at your table. Pictured is my sister-in-law Kellie and some yummy sliders that were served as one of the many appetizers that night (they sent some veggie ones, prepared especially for Trav and I-- very much appreciated). I am a SALAD GIRL. And this one took the cake. We have had the pleasure of meeting SO MANY amazing, life-changing friends while sailing! Among them are the wonderful Mills family of Tiverton, Rhode Island. We met them over a year ago in the Exumas and here's the SERENDIPITY: they have a daughter named MOXIE. Since we met and became fast friends, they've invited us on some fun New England adventures, including the INTERGALACTIC RHODE ISLAND UNREGATTA that Hud and Viv got to participate in last month. Thank you Mike Mills for making this possible for our kids! Here are Hud and Viv, sculling away (using the rudder to propel your boat when there's no wind) in one of the day's many races. The wind picked up and Viv got to race with her pal Marley. Hud & Viv and the lovely Mills sisters (Maya, Moxie, and Marley) and their puppy Jake. Hud at the helm of the Mills' boat with Mike. Hud loves piloting ALL boats . Moog rides possibly the smallest wave of her life, it wasn't beautiful but we were all pretty desperate for a surf fix and this did the trick. Hudson and Sparklemuffin-- this boy can sail around Great Pond for HOURS. Buying this Sunfish was one of Trav's best ideas ever. Reason #6,783 why we love Maine: the FUNK. Maine is full of the oddball and the unexpected. It's a mixed bag of kookiness, genius, and genuine soul. Nothing demonstrates that better than this sign on the door of Steve Lekos' art gallery in Skowhegan. We looked at some of his art through the gallery windows and it's really interesting! Unfortunately, that day we didn't have time to ring the doorbell and count to 200. We are definitely going back. Senator Margaret Chase Smith was the first elected female US senator. She was from Maine. She was the only congressperson who dared stand up to Joseph McCarthy during his tyrannical Communist witch hunt that destroyed many lives (she delivered her Declaration of Conscience to Congress in 1950 and if you haven't read it, please do--it's incredibly relevant for today's political quagmire). She was an American hero, a true role model of integrity, and also a very good friend of my Father's. As a teenager I got to meet her and spend time with her in her Skowhegan home. Later, at Bennington College, I wrote a one-woman show about her life and performed it as my senior project. This week, we went to the Senator's home, the Margaret Chase Smith Library in Skowhegan. Here we are with my parents. It was super special for all of us, and especially important for Hud and Viv to learn about her life's work and contributions to history. Now more than ever, kids need to be learning more about strong women who accomplish great things. Margaret Chase Smith is my hero and one of my biggest influences in life. This bench in the Central Maine Veteran's Park honors my father's service as a Marine in the Vietnam War. The Cabbage Island Clambake is a Maine tradition, going 60 years strong. This was our first time going, and the entire experience was THE BOMB. After a tour of Boothbay Harbor via ferry, you arrive on the tiny Cabbage Island and are treated to one of the BEST traditional Maine dinners we have ever had. They give you an insane amount of food, all cooked on a giant bed of seaweed: 2 lobsters, a ton of steamed clams, corn on the cob, a baked potato, an onion and a hardboiled egg (!?! ), and finished by an absolutely mouthwatering slice of blueberry cake. Can you see why we all gain 10 pounds when we come to Maine? And here's the SERENDIPITY of this day: on the ferry to Cabbage Island, Trav was chatting with a woman who hen just happened to be standing next to. In the course of their conversation, he discovered that this lady is the mom of our friend in Telluride, Rick Fusting! The Fustings have kids around our kids' ages and Rick's wife Cindy coached hockey with Trav. Our gang sticks together, and we are RARELY (like, once a year, for one night) without our kids. This week, Trav's Mom and her husband Tom took Hud and Viv for TWO WHOLE NIGHTS! And so here comes more SERENDIPITY: on a whim, we decided to try to stay at the Craignaire Inn near Owl's Head. The Craignaire has been a special place for us since we were in our 20's-- in college we once treated ourselves to a fancy dinner there and ended up having to scrape change from the car ashtray to pay for it. Years later, when Hud was 3 and Viv was only a month old, we stayed there as a family and had a magical time. When we called to see if we could spend the night, they told us that we were in serious luck-- the whole place had been been booked for weeks, but one single room had just become available that day when someone cancelled at the very last minute. Lucky. This post was supposed to be about the next legs of our journey (back to Grenada and then to Chamonix, France) but we just had to share these stories first. The uncanny happenstances of our lives keep bobbing to the surface. And I suspect that these happy chances, the big and the small, are there for everyone, if you put out the intention to find them. I know that we will keep our eyes peeled for serendipity..it's the wonder and the joy and the unexplainable nature of life that we prize most. You're going to France!!? Awesome!